Let the Mac's 25th Anniversary Begin! 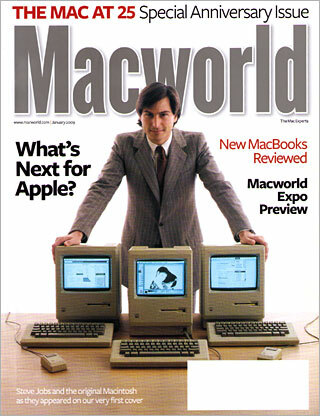 A few days ago, I received the newest issue of Macworld magazine, which marks the 25-year anniversary of Macworld. The Mac itself will be a quarter-century old on January 24, 2009. A while back, I reflected on how far we've come since that first little beige box people everywhere have come to know and love. This issue of the magazine points towards the grand future to come. Not only that, but the writers of Macworld also talked about which Mac was their favorite. I have been primarily on the Mac platform since early 2002. However, my favorite Mac of all time predates this period slightly, having been introduced in 1999. The clamshell iBook is my favorite for many reasons: It was Apple's first true consumer portable, looks awesome, has an immensely handy carrying handle, and was one of the first laptops to incorporate wireless networking capabilities. I think my favorite feature of the clamshell iBook is that, even after nine years, it still turns heads and garners comments everywhere I take it. I can still get about an hour out of the original battery. (Man, I really need to get a replacement.) Plus, I don't think I know anyone who has had a laptop, other than an Apple, last for almost a decade. I must also admit that I really like the current lineup of Macs. The new predominantly glass and aluminum designs appear quite attractive and professional in a variety of settings. I have also been especially impressed with Apple's obvious commitment to helping the environment. Frankly, I don't care what Greenpeace says about it: Apple is the only company that seems to make environmentally friendly technology something more than a publicity booster. The predictions Macworld makes seem quite plausible. I have personally given up on trying to predict any Apple maneuvers, as my crystal-ball appears to be defective. If the immense progress of the last 25 years is any indicator, I can't wait to see where the Mac will be in 2034. Maybe by then manual interface devices like keyboards mice, and displays will have fallen by the wayside in lieu of the all-important neural interface chipset.